Featuring Sam's biggest battles to yet. So just how serious is Serious Sam 4? Well, given that I am watching one of its developers merrily crunching through a shrieking alien horde using a combine harvester while also picking off stragglers with shotgun bullets, I’d say it’s exactly as serious as you would desire from the series. In fact, my whole visit to Croteam’s Croatian studio is peppered with moments exactly as serious as this, both in-game and IRL. For example, there was the music studio, full of complicated doors and sound dampening. It isn’t used as it’s not quite ready (and hasn’t been quite ready for years) so the music is recorded in an office just opposite the not-quite-ready-studio. The demo deposits Sam ‘Serious’ Stone in the middle of the French countryside. He’s about three kilometres away from his target; the town of Carcassonne. He heads to the road and procures a motorbike by blasting an alien who is busily munching the bike’s original owner. Moments later a charging werebull sends Sam flying. Soon after dispatching the werebull I’m watching a horde ambush Sam from all sides, running towards him, flailing. If I had the controls this is probably the moment my muscle memory would kick in and send me jogging backwards in circles while lining up shots. As the demo progresses we hear from other survivors, one of whom chucks a sniper rifle out of a church tower so Sam can lend a hand disposing of monsters. It’s a little after this that we end up in that cornfield atop a combine harvester, listening to a jaunty banjo tune and mulching the heck out of orange jumpsuited folk. I figured that would be the centrepiece of the demo. It’s definitely emblematic of the franchise’s daft shooteryness. But it’s the next (and final) sequence which I think will be the most tantalising—a full army of enemies appearing over the crest of a hill. My experience of Serious Sam is of this omnidirectional drip-feed of screaming jerks—this is more akin to a Total War battlefield. Croteam says that the game will feature the biggest individual levels the franchise has ever had, and that this and a new terrain engine will support the epic battles which the demo hints at. This change in scope is part of the ‘Planet Badass’ theme of the game. Rather than Sam blasting his way through these worlds as a lone badass, this time he is one badass amongst many. Talking to Ladavac, Croteam had started to make that change from lone badass in Serious Sam 3, but lacked the resources to put many characters into the game. This time around you’re joining the remaining chunk of humanity in trying to resist series antagonist, Mental’s invasion of Earth, so it’s a prequel. “We’re all for prequels of prequels,” says Ladavac. “When you put that together with time travel it’s very interesting because the third one is actually before the first one but it’s actually after the second one because he went back in time. It gets complicated!” This conversation is starting to feel like Mulholland Drive. Rather than trying to draw a timeline out of all this, you just need to know that Earth is now a planet populated by remaining badasses. “It’s pretty badass,” concludes Ladavac. Curiously, the story is being handled by Jonas and Verena Kyratzes. Jonas previously worked with Croteam on The Talos Principle, but from talking with the studio and experiencing snippets of the dialogue, as voiced by the pair in placeholder audio, the tone is very much Serious Sam and not philosophical android consciousness puzzler. In terms of the game structure, despite some huge levels, Croteam is keen to point out that Planet Badass will not be an open world game. The team likens it to Uncharted 4, with large maps you can explore for sidemissions or Easter eggs but ultimately there’s a linear mission path to follow, and the vast 128kmx128km level spaces will be interspersed with smaller maps. “In other words, we’re just using this tech to take Sam’s new adventure on a brutally bigger scale and tell the story, instead of building the game around the tech,” explains Ladavac. I’m assuming the Sam in this instance refers to Sam Stone and not Samwise Gamgee; the latter is cleanshaven but lacks a minigun. Supporting this cinematic scope is a slight change in the music direction for the franchise. The games’ soundscapes have traditionally focused on instruments and rhythms closely linked with the location. 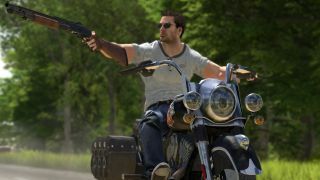 Serious Sam 4 will still have that element, however Damjan Mravunac—he of the E3 guitar ballad and eternal sound studio construction fame—explains that the whole thing will sound more cinematic. But let’s go back to the field of jumpsuited monsters which you macerate with a combine harvester. I recognise enemies like the werebull and the iconic kamikaze bombers (the screaming folk with no heads and bombs for hands) from elsewhere in the demo but these are new. Ladavac tells me that they’re called Processed. As part of my studio visit I get shown into a room brimming with odd, homebrew tech accessories. It turns out that this is Croteam’s in-house mocap solution. Instead of the familiar warehouse-sized space occupied by people in leotards studded with ping pong balls, you’ll find chief creative officer, Davor Hunski, in a little office space, strapping sensors to his limbs. The kit uses HTC Vive technology so base stations fixed to the upper corners of the room monitor 17 trackers which are attached to different parts of the body. I asked to try the system myself and ended up with three trackers per limb (upper arm/leg, lower arm/leg and hand/ foot) one on my head and one affixed via a military belt from the Croatian War around my waist. The kit uses HTC Vive technology so base stations fixed to the upper corners of the room monitor 17 trackers which are attached to different parts of the body. There’s also a harness which puts one on each shoulder and one to mark your chest but I left that one off as I didn’t need that extra layer of precision. Even without the harness the tracking took me by surprise with its accuracy (although this was a mixed blessing given I couldn’t then blame the setup for how wildly inaccurate my version of the Single Ladies dance was). Hunski also demonstrated other elements of the system, for example, how you could use the software to record one character’s movements, then switch to another character in the scene and record their movements in order to interact with the original character. You could also pick up a camera prop which was fitted with trackers and switch to that view, recording a third-person view as a camera crew person. One of the intentions with this system is to be able to make the workflow a bit easier to manage. So if any changes are required, instead of getting actors back into a third-party motion capture studio to re-record entire sections and having a back and forth about what works and what doesn’t, you’d be able to just pop into the other room and record a new section as and when it was needed. Some of the recordings made using this system have found their way into Serious Sam 4 already. For example, the idle state animations of the Processed enemies are made using Croteam’s own motion capture tech. The team won’t be replacing all character animation with its own motion capture, though. Instead Croteam is just using whatever works best in a scenario. The Processed idle animations worked well with the technology, but the team got better results for running by using handanimation techniques. I’m guessing that’s at least partly due to the small space that Hunski is working from. It’s pretty hard to record someone running full tilt across a room that only has a few square meters of floorspace, and each surface is covered with sensitive hardware. Despite seeing so much of what’s going on under the hood of Serious Sam 4 there’s plenty yet to be revealed. The demo acts as a statement of intent and reassures players that the series staples are still present and correct. I mean, mostly you’ll want to know that enemies will still run at you shouting, “AAAAAAaaaaaAAAAAAAAAaaaaA!” and that there will be plenty of explosive weaponry to use against them, right? But the intriguing tease of that Legion system and Ladavac’s remark on the weapon front that “truly deadly pieces are still under wraps” underlines Croteam’s promise of “signature Serious Sam gameplay on a brutally bigger scale”.